American Mistletoe reigns over the winter forest. It’s invisible during the growing season, lost in the myriad green leaves of its host trees. But when those deciduous leaves color and fall to earth, the evergreen clusters of American Mistletoe reveal themselves to all who cast their eyes skyward. 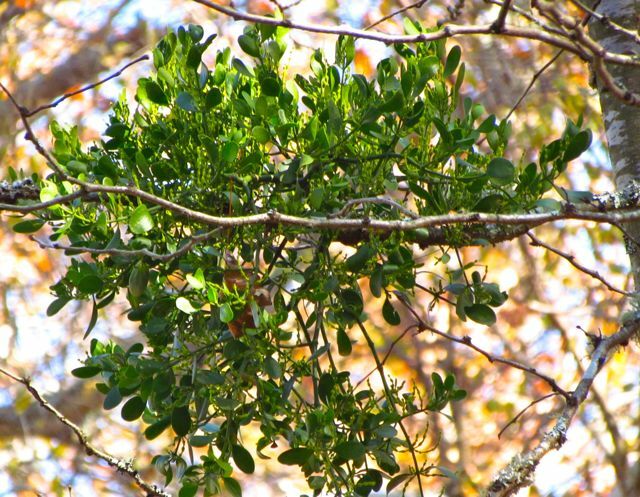 According to Weakley’s Flora of the Southern and Mid-Atlantic States, American Mistletoe’s scientific name is Phoradendron serotinum ssp. serotinum, but you’ll see it often listed by an older name, Phoradendron leucarpum. Some folks call it Oak Mistletoe, after one of its favorite host tree species. Over 100 species of deciduous trees have been noted to be hosts for American Mistletoe, but you most often see it around here on oaks, maples, and sometimes hickories. My American Mistletoe, in the photo above taken this morning before the clouds departed, is not growing on any of those species. Instead, it is happily established on a lichen-covered Honey Locust that I planted years ago in the hopes of providing more food for wildlife through its flowers and seedpods. The tree hasn’t thrived, but it stubbornly persists, each year playing host to more life in the form of various lichens, and the parasitic American Mistletoe. 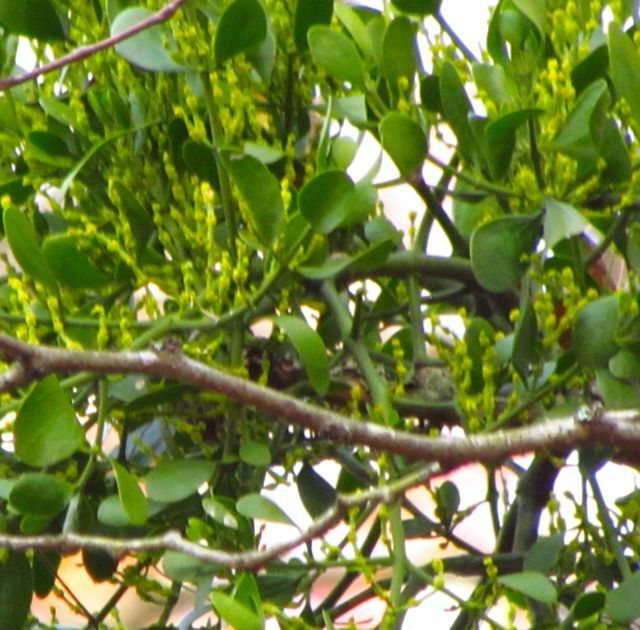 About a month ago, my Mistletoe was in full bloom, although the small yellow flowers are hard to spot. As I read up on this plant, characterized by botanists as a subshrub, I discovered some disparities among the experts regarding American Mistletoe’s parasitic nature. Many claim that this plant, which lives by sending root-like structures into the tissues of its host tree to extract water and nutrients, is purely parasitic, and if many plants establish themselves on one tree, eventually fatal to their host as they drain it of life. However, other experts note the plant’s evergreen leaves and stems, pointing out that, during winter, Mistletoe is actively photosynthesizing, thereby creating its own food. And it’s not impossible to believe that some of those synthesized nutrients may actually go to the host tree during the winter season. I think perhaps this is more speculation than tested fact, but it doesn’t seem that far-fetched, and may perhaps explain why American Mistletoe can persist in a tree for decades without any obvious damage to its host. This somewhat blurry shot is my attempt at a closer view of the inconspicuous flowers. Europe has its own species of Mistletoe, but our American species is fairly similar. Both produce waxy white berries. 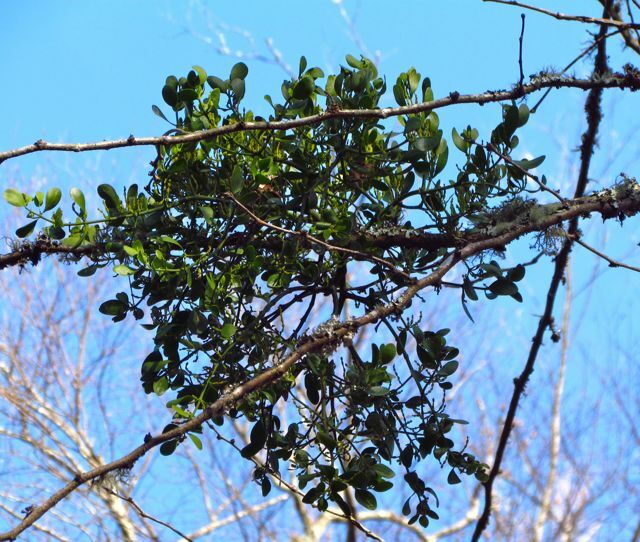 The European version is more poisonous than our species, but even American Mistletoe can be dangerously toxic. All parts, especially the berries and leaves, are poisonous. As is true for many poisonous native plants, American Mistletoe was used to treat a variety of ailments by Native Americans. However, extracts from the plant derived for experimental cancer drugs have proved too toxic to be useful, so I don’t think anyone should try using this plant for more than ornamentation. Vivid against a winter-blue sky, American Mistletoe is Love in the Air. Fruit-loving birds, such as Cedar Waxwings and Eastern Bluebirds, are responsible for spreading these plants from tree to tree. The berry pulp is extraordinarily sticky, readily adhering to beaks and feathers. As birds wipe their beaks on branches to remove the pulp, they may deposit a seed in the crack of a branch, where it can germinate and penetrate its host. Another avenue is bird droppings. Some evidence suggests that the fruits pass very quickly through avian digestive tracts, increasing the chances of seed deposit on an appropriate host tree, since the birds don’t travel far before making that deposit. Caterpillars of the Great Purple Hairstreak are only known to dine on American Mistletoe, which is just another reason to welcome its presence on your deciduous trees. A quick survey via your favorite search engine will provide you with several proposed mythical origins for the tradition of kissing beneath Mistletoe. I suspect the tradition became associated with the Christmas season because this plant is so much more noticeable in winter’s barren landscape. 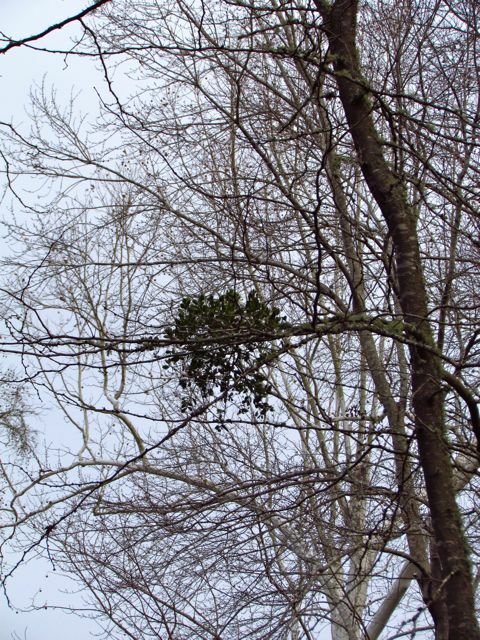 However the tradition came about, spotting a green orb of American Mistletoe high on an otherwise leafless tree in winter seems an excellent excuse to steal a kiss from someone you love. This entry was posted on December 13, 2012, 11:42 am and is filed under Favorite Plants, Native Wildlife, piedmont gardening. You can follow any responses to this entry through RSS 2.0. You can skip to the end and leave a response. Pinging is currently not allowed.